Posted On February 13, 2015 by Team iCynosure. Maybelline Maybelline New York India surely knows the way to a girl’s heart. You may wonder how? It’s really simple. Put gorgeous products together in a super cute pouch and launch new InstaGlam Gift Kits. 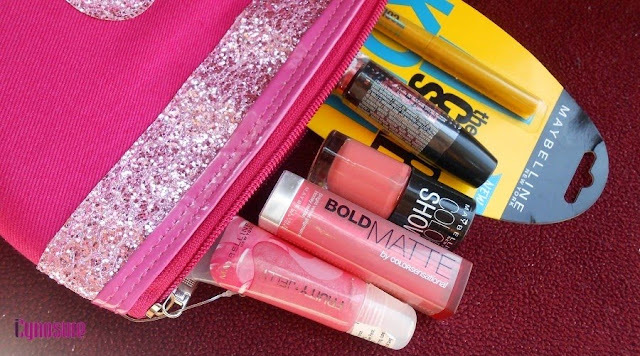 I’m a sucker for cute pouches and the Maybelline InstaGlam Valentine's Gift Kit is my dream come true. I love kohl but never experimented with color. The turquoise in the instaglam pouch has arrived at the right time for me to try on a new unique shade to highlight my eyes. The hyper curl is my go-to mascara as it is very natural on application and looks enduring. Without adding much drama to the eyes it gives the lashes the perfect curl. The Honey Nectar is a yummy orange bold matte lipstick with pink overtones to sit beautifully on your lips to bring in the romantic day and charm your Valentine. One of the best from Maybelline is the Color Show range of nail polishes that are gorgeous and great quality yet affordable and lasting. The Coral Craze is a healthy mix between Orange and Peach that will look beautiful but not obstructing. This is a great product for its muted color and glossy finish to give fuller luscious lips. Add a baby dollop to the center of the lips after applying the lipstick for a kiss-ready pout. The products are worth INR 1224/- however there is good news as it retails for INR 999/-. This gift kit is also available in Pink and Red. No sooner did I receive the pouch, off I went to try and create a cute coral look. After doing the basic base make-up routine I created a subtle look using the products received in the InstaGlam Pouch. I am in love with the Maybelline InstaGlam Valentine edition pouch because the products are put together with a lot of practicality and retailed at a great price tag. So if you still haven’t bought a gift this Valentine, rush to get the Valentine InstaGlam Gift Kit for your girl and she will definitely be very very pleased. And all you girls out there #TurnUpTheLove and gift one to yourself, why wait for good things, go out and get it. What do you think of this InstaGlam Kit? Which one would you opt from the three variants? Leave your comments below.